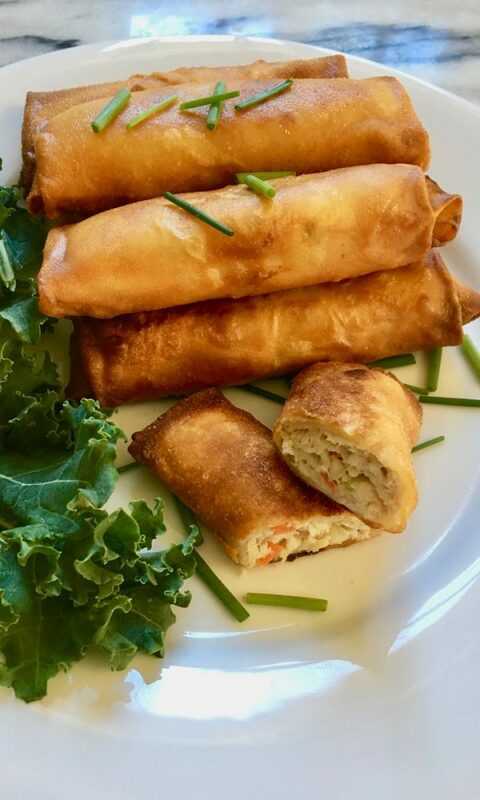 Once in a while we all crave for something crispy like this chicken spring rolls. 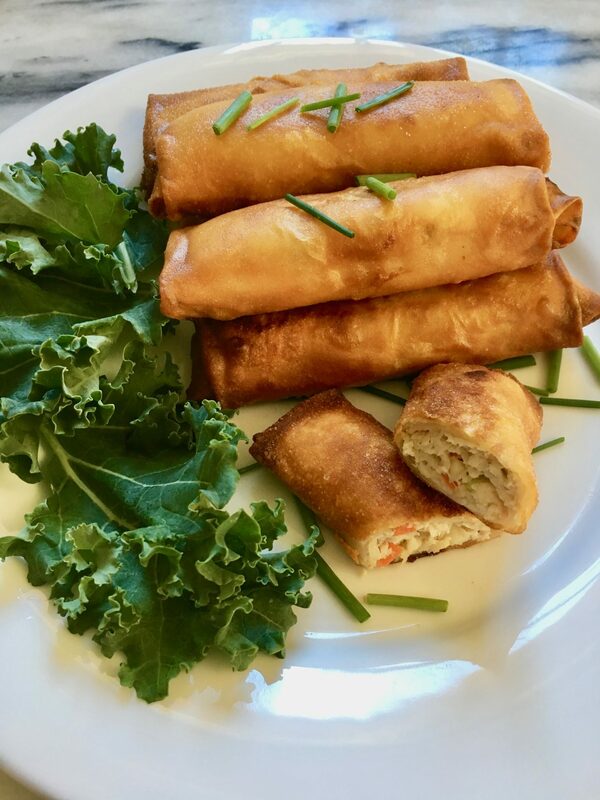 Although it’s fried, the filling is made of healthy chicken and vegetables. Therefore, I don’t feel guilty eating it. And I certainly think it’s ok as long as we eat healthy most of the time. 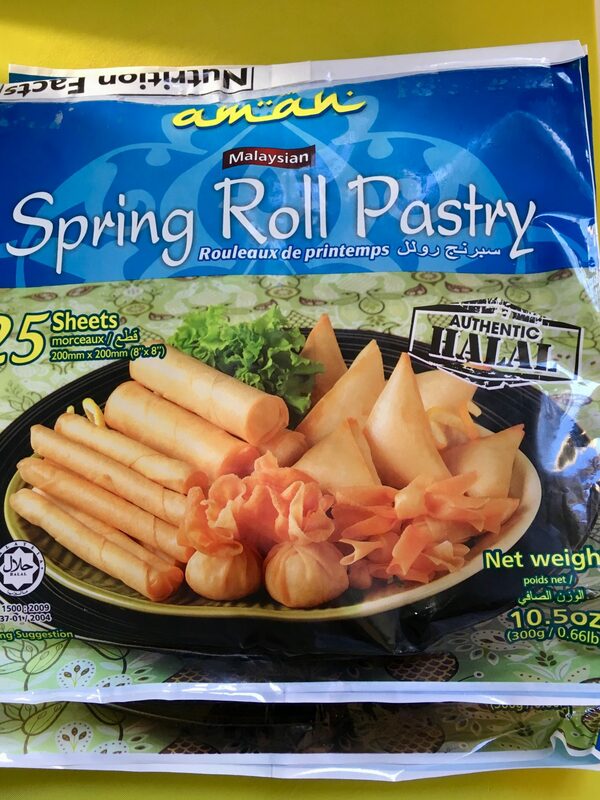 If you can find Aman Malaysian frozen spring roll wrappers shown above left, it’s actually the best one to use here. What I really love about it is it’s so pliable and easy to handle, plus it doesn’t break easily. In fact, not a single one of them broke as I was wrapping the filling. Also, try not to pull them apart all at once because they will dry out. It’s better to gently pull one at a time and wrap it. Then repeat until all filling is wrapped. If you follow all the steps above, this recipe is so easy and fun to make. 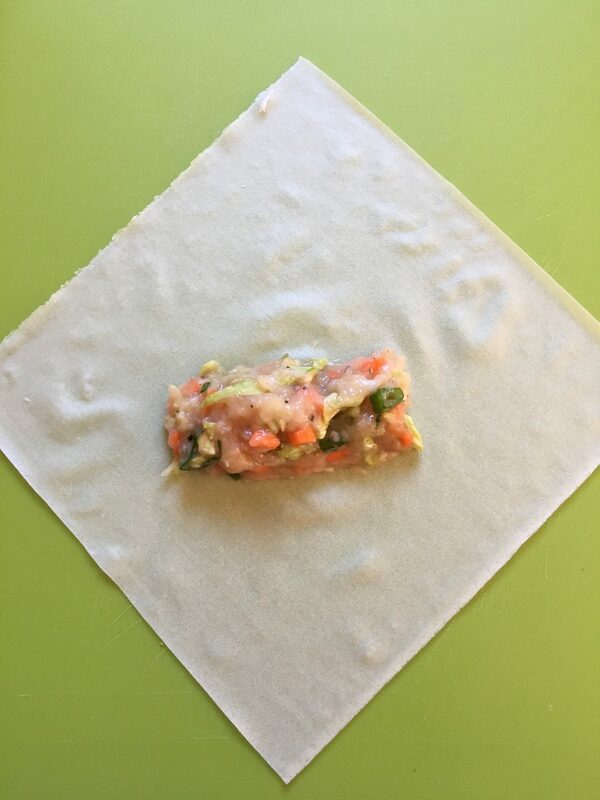 Just mix all the ingredients, wrap and roll it, then fry them. So I hope you try it! 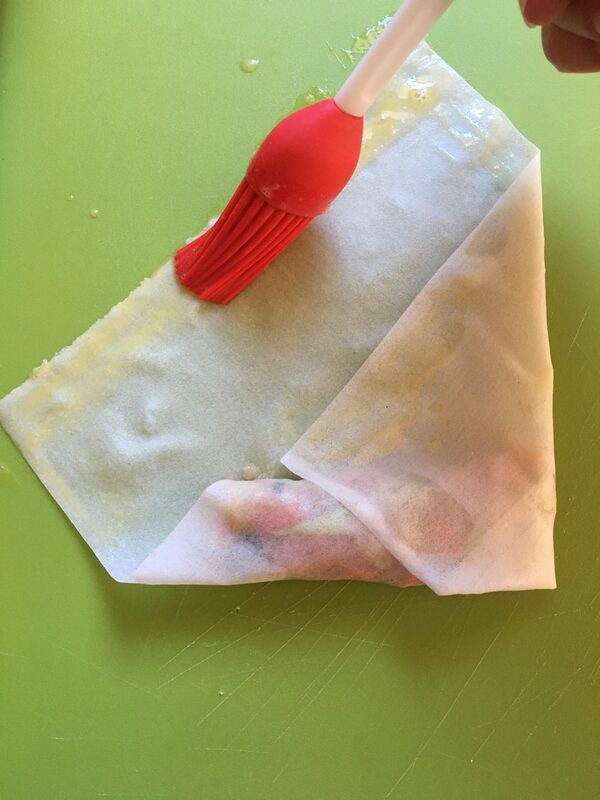 Thaw frozen wrappers for 20 minutes on the counter. Next, beat 1 egg in a small bowl. In a large bowl combine ground chicken, carrots, onion, garlic, cabbage, salt, pepper, fish sauce, Mirin rice wine and 1 beaten egg. Then mix well until well combined. 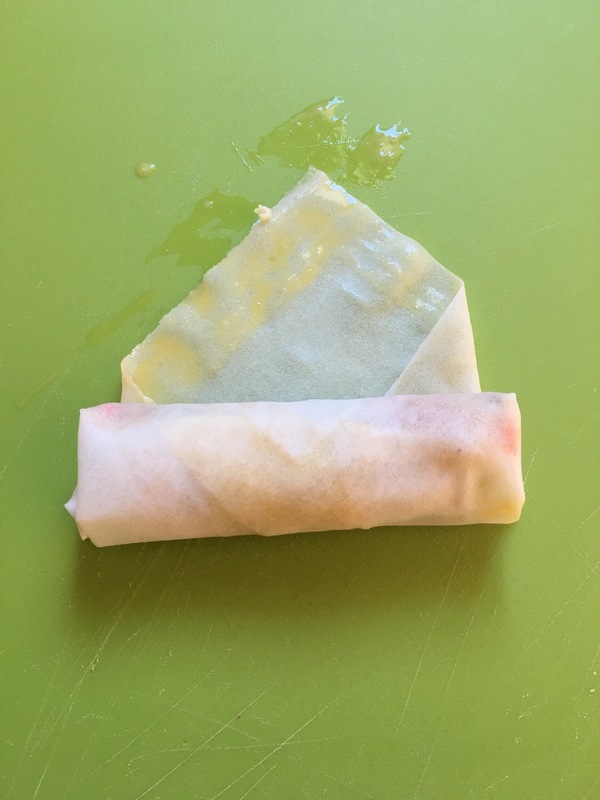 Use parchment paper or Silpat liner as a work surface to wrap spring rolls. Beat the other egg in a small bowl. Then gently pull 1 wrapper at a time and lay it on a diamond shape. 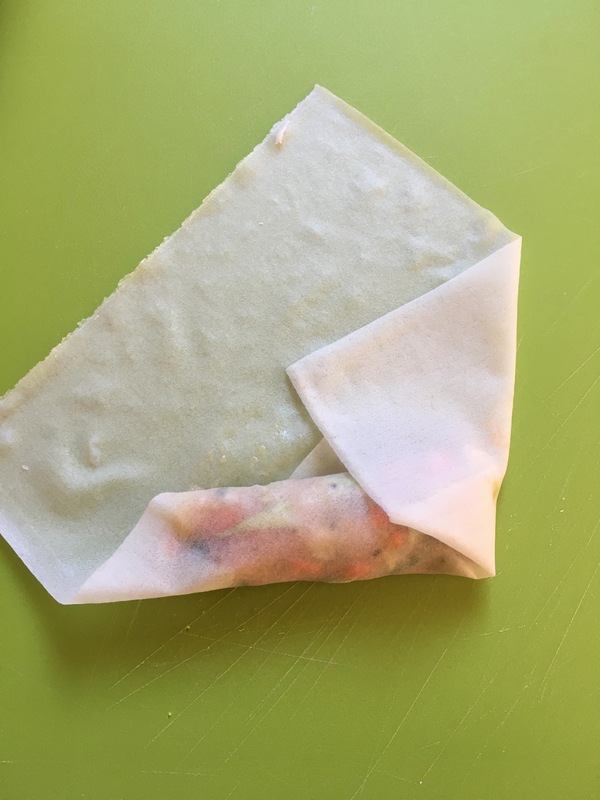 Fill wrapper with 2 Tbsp filling and fold bottom end over. Tuck it under and lightly brush unfolded ends with beaten egg. 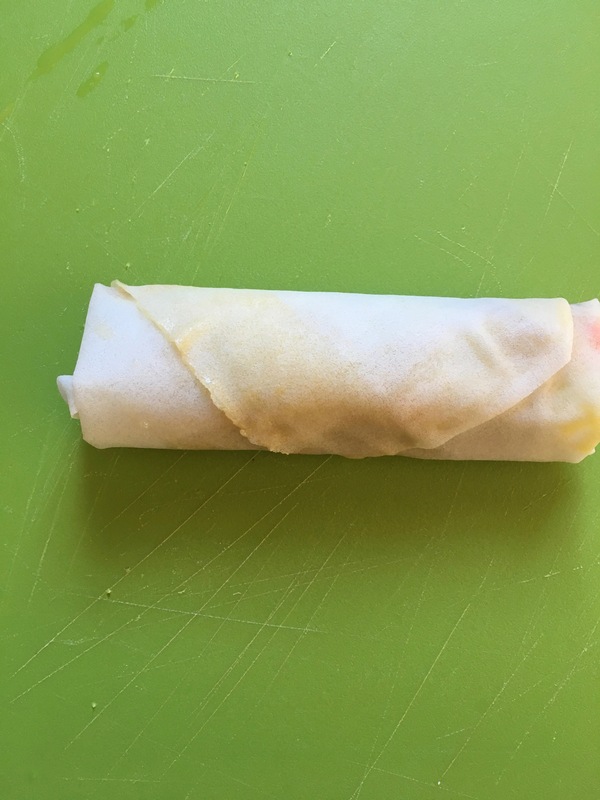 Fold left and right toward the center, then roll it over. (See photo) Repeat process and it should make about 16 spring rolls. Lay them on a platter in a single layer. Add oil into the skillet, to about 1/2 inch deep. Heat oil at medium/high heat. 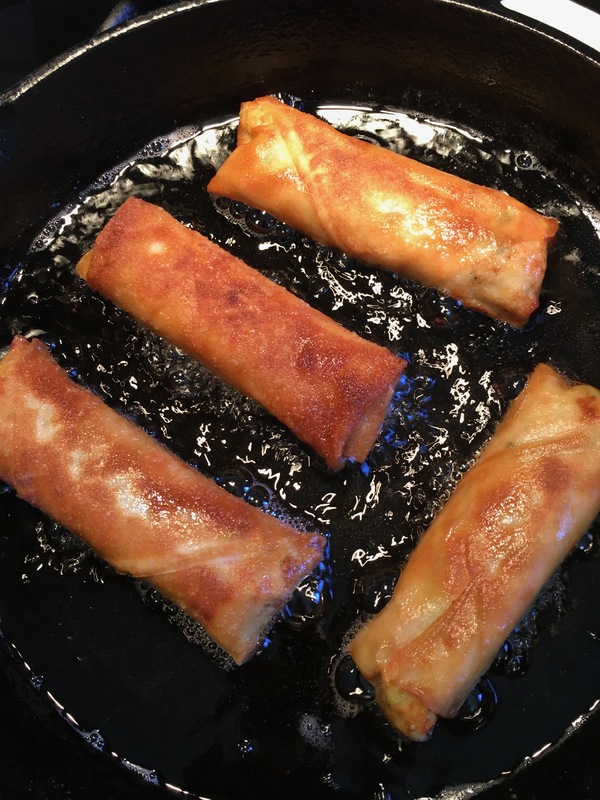 When oil is hot, start frying spring rolls for 2-3 minutes on each side, until golden brown. Do this in 3 batches. Do not crowd the pan. If it's browning too fast, reduce heat to medium. 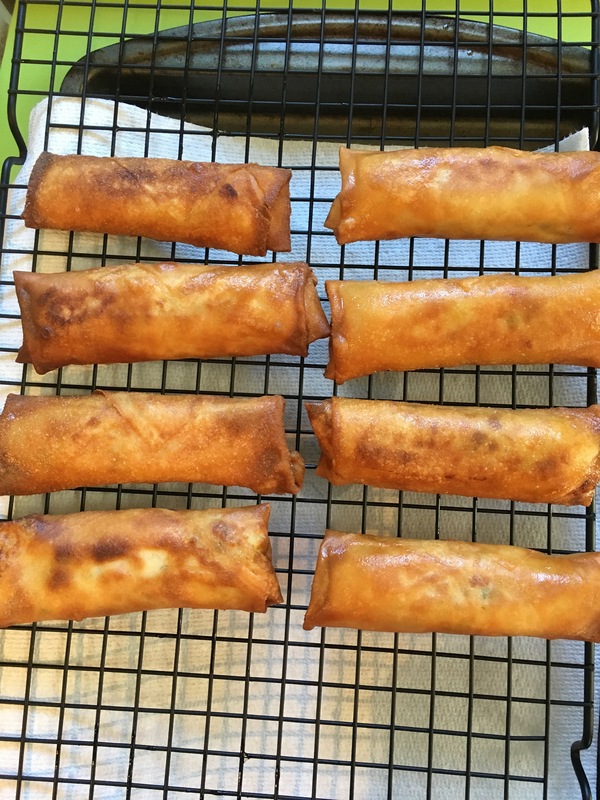 As they cook, transfer spring rolls onto a cooling rack placed on top of a paper towel-lined baking sheet. Serve immediately with prepared sweet and sour sauce. If you don't like store bought sweet and sour sauce, you can certainly make your own. In a small pot whisk together: 6 Tbsp sugar, 2 1/2 Tbsp plain rice vinegar, 1/3 cup water, 2 Tbsp soy sauce, 2 Tbsp ketchup, 1 Tbsp cornstarch, and optional few drops of hot sauce to taste. Let it simmer on medium heat while whisking for about 2 minutes until thick. Any leftovers you can keep in covered container in the refrigerator for 2 weeks.